This Computer Chess Game is small and portable for Chess on the go. It is ideal for beginner through intermediate chess players. 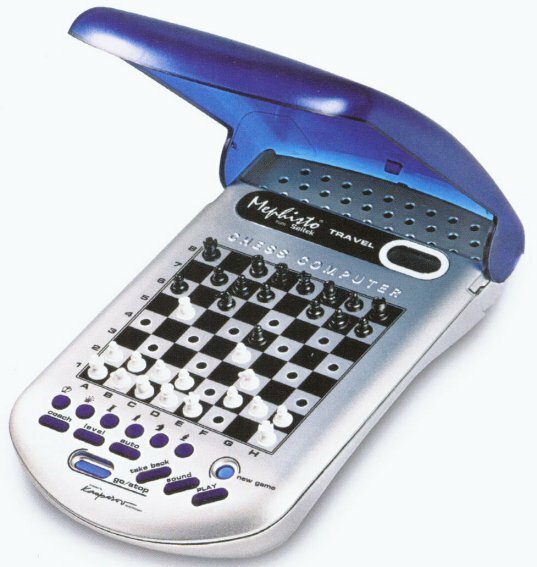 This compact Chess computer will assist you in shapening your playing skills. For example, you can choose an easy level at the beginning and as you develop the need for a bigger challenge, the game's built in coach will guide you to improve your strategy. Program Features: - 64 Playing Levels: Fun, Casual, Blitz, Bronstein, Bonus Timer, Tournament, Fixed Depth & Tactical. – 16 stored opening systems (100 moves) – 14 move Take Back-experiment & learn- 11 teaching modes for easy learning. It also comes with a Pressure Sensory Chess Board, LCD Screen, Chess Clock, and Protective Cover. It even holds your unfinished games in memory so you can pick up where you left off. Uses 2 AAA batteries (not included).